A casino is a place where the players come to enjoy themselves. They want a casino game to be delivered to them just like they expect to be serviced at any type of restaurant or cafe. They want the game to be presented in an efficient and a friendly manner without any delays. Another major detail that online casino dealers must remember is that they take the players' money when they lose at the table. It is need to be done in a compassionate and a friendly manner in order to keep the players feel happy. Traditionally the dealers were stern and serious looking individuals who just dealt the cards at the table without any passion at all. This was because in the past the duty of the dealer was simply that, just dealing the cards. They had also been responsible to take care of the bets, placed on the table and watch out for any suspicious behaviour. The image had been very strict but it had been worked for ages. However, casinos are changing today and so the dealers must change too. Casinos are not just where the players go to win money. People go to the casinos more for enjoying themselves and not really for just the money. Therefore, the role of a dealer should be more than just dealing the cards. Today the casinos ask more from their dealers than just hand shuffle of cards. The dealers are expected to even entertain the players at their table and keep them happy. The players themselves want their dealers to be more talkative and cheerful. A casino which has fun dealers will always be more attractive to gamblers than the others. Dealers work very long hours and they come across several different categories of people during their normal work day. They must therefore be capable of entertaining every type of individual and must be able to hold a good conversation without neglecting their basic duties. The gamblers too pay a lot of their hard-earned money in order to play at a glitzy casino so they too would expect a little extra from the casino. Having a dealer who is efficient and entertaining works out the best for all the parties concerned. Getting a dealer who is efficient and who also has a cheerful personality has become a basic necessity for casinos and so many casinos include this in their job requirements. 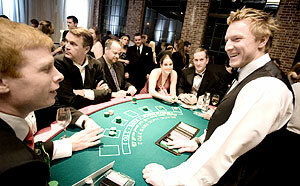 Several casinos even go to lengths of hiring fun people even though they do not really know much about dealing. Casinos then train them to be dealers. A good dealer must know when to be compassionate and when to be witty. He must be funny when required and serious and stern when the job asks for it. Players do not want to play at a table where the dealer has a bad attitude. So it is necessary for the casinos to get dealers who are not grumpy and are able to make the experience of the players a pleasurable one.